Meat rocks are the new valuable collector's item in China. Stones that look like meat are displayed at a strange stone exhibition last year in Huaibei, Anhui Province of China. All collections are inherently a touch bizarre: Why do we display commemorative dishes, or stamps, or useless figurines? But even within the realm of strange collections, Chinese “meat rocks” are bizarre. The Wall Street Journal offers this in-depth look at the growing phenomenon of collecting rocks that look like marbled pork or beef, a new and growing pursuit among Chinese collectors. Hundreds of members have joined a new meat-rock research group, and meat rocks have their own dedicated museum in Lushan, China. (I am calling dibs on the name Meat Rock for my new female-fronted metal band, by the way.) Thanks to increasing state media coverage, The WSJ reports prices for meat rocks have skyrocketed, with especially good specimens selling for thousands of dollars. Towns are also looking to meat rocks to drive tourism, and a meat-rock expert has written a book with guidelines for classifying and grading rocks on a 100-point scale. Why? There does appear to be a historical root for the recent meat-rock craze: Some see it as the continuation of a centuries-old tradition of valuing these rocks for their aesthetic and mythic properties. 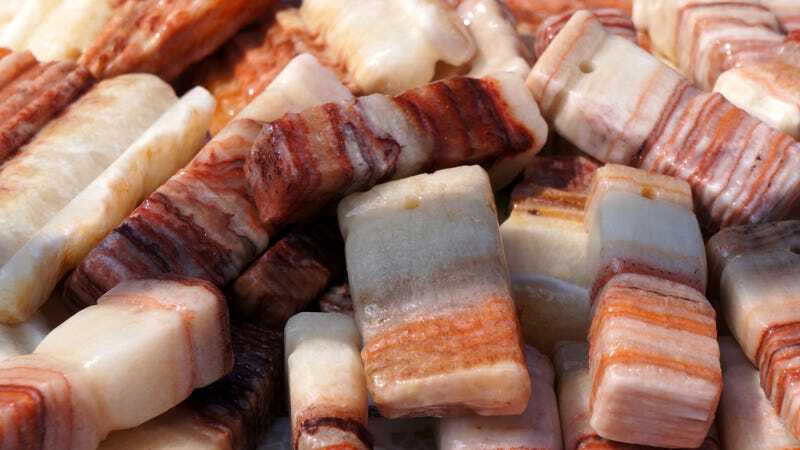 Plus, says Yuan Ziming, a collector from the northeast city of Tianjin: “Everyone can appreciate meat rocks.” Indeed. Read more about this fun hobby—if there was ever a reason to pony up for WSJ digital access, it’s meat rocks—over at The Wall Street Journal. Ask Kate About Beer: How cold should my beer be when I pour it? Ask The Salty Waitress: Why do servers always check in when my mouth is full? Am I the only one still collecting Red Rose Tea figurines?